GENOMIC SEQUENCING FOR PROSTATE CANCER – Which Men Gain a Clinical Benefit from Genomic Testing? Ever since the first orchiectomy for metastatic prostate cancer in 1941, researchers and clinicians have been determinedly trying to restrain the androgen receptor (AR) by manipulating its hormone environment. But like Houdini, after initial suppression this wily adversary wriggles a bit and then escapes — transitioning prostate cancer into a castration-resistant state. Alterations in the AR eventually frustrate the beneficial gains from LHRH inhibitors and anti-androgens like Zytiga, Xtandi, Erleada, etc. This escape is accomplished by a variety of different mechanisms, presenting the challenge of anticipating and circumventing the persistence of AR signaling. Many important developments have taken place since Enzalutamide (ENZ) was reviewed in the March/April 2014 issue. This Commentary will discuss these developments and the current indications for ENZ and new studies of ENZ as monotherapy. A subsequent Commentary will address sequencing, resistance, and possible potentiation of immunotherapy. Ga68-PSMA-11 PET/CT Scanning at Initial Diagnosis for High-Risk Prostate Cancer: What is missed by conventional staging and does it matter? 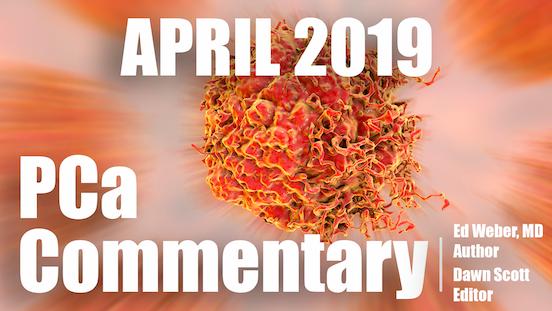 For this Commentary, eleven research papers reporting the results for the Ga68-PSMA PET/CT applied to high-risk prostate cancer were reviewed. For interest, here is the list of research locations: Australia (3, where the scan is readily available), India, Turkey, Germany (2), Jordan, and the USA (3, UCSF, UCLA, and Johns Hopkins). It has been one year since the Commentary featured the Axumin PET/CT in the November 2017 issue. A great deal of new research about this scan performance has been published since then. The material in this issue is based on this research. Overall, these studies focus on the Axumin scan, which provides clinically relevant information at PSA levels that lead to significant changes in treatment plans for a majority of men. Immune Checkpoint Inhibitors — The Search for Clues for Which Men Will Benefit and How Best to Treat Them. Harnessing our immune system to treat cancer has been an elusive goal for decades. Research in immunotherapy is intense with active study of the newest advances, i.e. checkpoint inhibitors and CAR T-cell technology. Checkpoint inhibitors have yielded encouraging results in selected patients (10% – 40% responding) with melanoma, bladder and kidney, non-small cell lung cancer, and cancer of the head and neck. However, the results of prostate cancer immunotherapy have been disappointing in unselected patients. Why is this? The article will discuss how Decipher is constructed, its benefits as a supplement to the standard risk assessments tools, and offer examples of its use in clinical practice. Additionally, the Commentary will highlight the work of Dr. Dan Spratt and colleagues that integrates the NCCN system with Decipher to achieve further prognostic accuracy (“Spratt, et al., Journal of Clinical Oncology, Feb. 2018”). Many of the important adverse effects associated with androgen suppression with Lupron, Firmagon, or orchiectomy result from estrogen deficiency. Estimates vary, but 50%, 75%, or as much as 80% of a man’s serum estrogen arises from enzymatic conversion of serum testosterone. And when ADT drops serum testosterone into the low range of 20 – 30 ng/dL, a profound estrogen deficiency results. NEUROENDOCRINE PROSTATE CANCER: An Adverse Development in Advanced Disease — Which Largely Has Flown Under the Radar. Neuroendocrine prostate cancer (NEPC) is a form of the disease which, as best currently understood, arises from standard adenocarcinoma in a process termed “transdifferentiation.” This transformation develops in advanced stages of prostate cancer—usually in metastatic CRPC, and is thought to result as an adaptation to the selective pressure of androgen deprivation. It’s usually seen after prior therapy with, for example, abiraterone and/or enzalutamide and is one source of resistance to these agents. The goal of active surveillance (AS) is to delay treatment, avoiding its associated adverse effects for as long as appropriate, while ensuring that selective delayed intervention will still result in a good outcome. This management strategy has been under development for more than 20 years. It has been increasingly accepted as an appropriate option for men with low-risk disease, but further refinement is required in patient selection and monitoring strategy. PSMA is a transmembrane protein of 750 amino acids expressed on the surface of ~90-95% of prostate cancer cells, increasingly expressed as aggressiveness increases. The expression of PSMA is negatively related to androgen receptor abundance so that ADT promotes increased PSMA expression. Its normal function is to ferry nutrients such as folate and glutamate into the cell to support growth and metabolism. Short sections of this convoluted protein molecule can be targeted and linked by small molecules (e.g., “617”) or antibodies (e.g., “J591”). These molecules can be fused to radiation emitting nuclides such as Lutetium-177, Actinium-225, or several others under investigation. At the 2018 Genitourinary Session of the American Association of Clinical Oncology, two presentations reported similar findings which offer management guidance for men whose PSAs are rising despite androgen suppression but have no objective evidence of metastatic spread. For men with metastases, Zytiga and Xtandi are commonly prescribed, but to date there have been no approved treatments for therapy at the nonmetastatic CRPC stage. AR-V7: The Clinical Utility of Knowing Your Status … And When the Information Is Most Useful. A test for the splice-variant AR-V7, Oncotype Dx AR-V7 Nucleus Detect (Genomic Health, Inc.), has become commercially available. This Commentary will focus on the clinical significance of test results — their predictive and prognostic value. What Can Be Learned From The First Reported Prospective, Randomized, Multicenter Phase II Clinical Trial? In December 2017, the JCO published the trial results of Ost and colleagues: “Surveillance or metastasis-directed therapy for oligometastatic prostate cancer recurrence.”1 Up to this time, there have been numerous retrospective and observational studies of varying design which, taken together, strongly suggest that progression-free survival can be prolonged by the focal treatment of three or fewer lesions at the time of PSA recurrence after primary therapy. This regimen is now termed “metastasis-directed therapy” (MDT) and was discussed in detail in an earlier Commentary. The message is clear. At diagnosis, 6% of men carry mutations in the BRCA1 or BRCA2 gene. At the stage of metastatic castration-resistant prostate cancer, nearly 12% of men exhibit these germline (inherited) mutations. Finally, as the course of the disease progresses through various therapies, the number of BRCA and BRCA-like mutations further increases and can be found in up to 23% of men.